A good link on some real flow numbers. no doubt alum heads are superior. I do wonder if those "fully ported" iron heads had the vanes untouched, finned or removed and what size valves were used. I also think a big part of why alum swaps are so beneficial is you get to get away from the crappy mpfi intake. I've read about some iron head setups who swapped to the edelbrock performer carb intake and put down decent numbers. yes the intake helps greatly but the main gain is just the heads. Their d ported exhaust runners, larger cc runners, better combustion chamber. It's just a overall better design. Cfm flow is greater no matter what you do to the iron. Just Imagine how much the large port gen 3 will flow with some solid porting. GM head design in v6 and v8 changed dramatically in the late 90s. Wow did they get better. But I'll stop hijacking the ops thread. Sorry. i'm also gonna try my hand at putting the "power lynz" into the ports to create a boundary layer for the air, increasing velocity and improving fuel atomization. as of 830 tonight the fins are gone.big mistake ? we shall see. but the heads couldn't get much worse than they were. Honestly I'm curious to see the outcome and you are right. Not much you can do to make them much worse then they started out as. they're not pretty and by no means professional but the boost should make up for it. I might go back in and work on em some more. what were the rest of your mods, gears, transmission etc. BTW if I was staying N/A I would leave them for sure. pretty good. got a pic of your fins? Last edited by AM91Camaro_RS; 11-15-2018 at 08:23 PM. very impressive for what it was. I've never heard of an iron headed NA v6 thirdgen going that fast. Man I haven't seen you on here in a bit! Good to see you are still around. 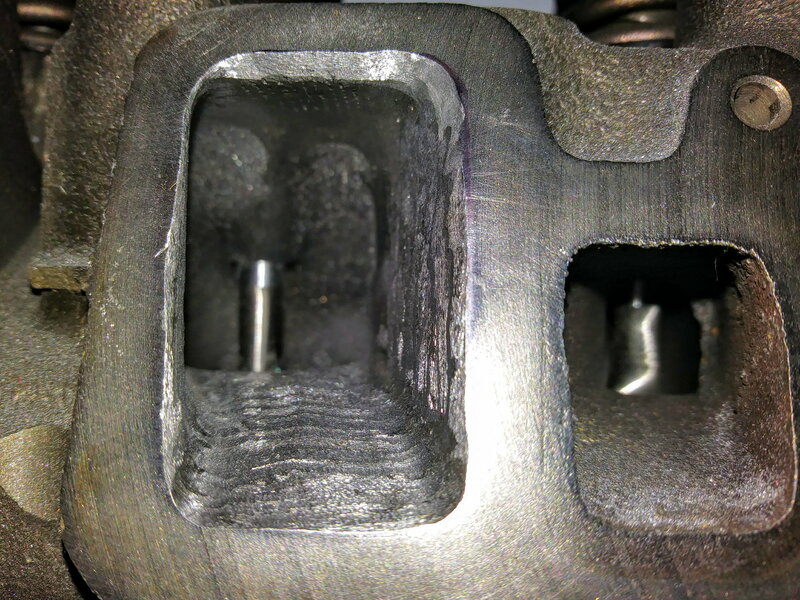 That was one mean gen 1 660.
fasteddi, what did you do about the intake manifold heat riser ports in the middle exhaust ports on each head? Seems like this would be bad for turbo exhaust flow if half of 2 of the cylinders are losing exhaust flow to the intake??? Last edited by Sierra6; 01-15-2019 at 10:08 AM. If it was me I would melt down some cast aluminum, fill the holes and then blend the bowls...well that's what we do with the OEM Oldsmobile heads when porting them. Unless there is another way to block the crossover you will probably be fine just leaving them open. you are right that would be a big pain if you have that there. well that's just not fair. I already have the new valves in and everything. i'd hate to have to do that. maybe this won't kill performance too bad. I might try to block it off on the intake side by welding something in there to block it. that port to the right of the left intake port is where the exhaust flows to the lower intake. I can see them in your heads, fasteddi. But I guess they might have been blocked off inside the exhaust port so you never noticed and like me thought it was a coolant port. I know my '85 heads had these, but I never looked at the new heads I had ported close enough to see if these were in there on them . (The new heads are from a 1989 2.8L) In all the pics I was sent, this was never shown. Fingers crossed that they don't have it either. I don't have the heads at my house right now to confirm. 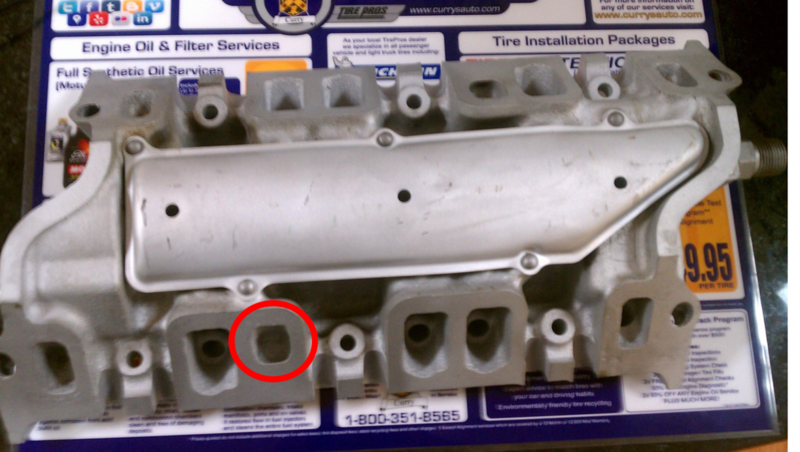 What does the crossover port look like on the intake manifold? looks like a coolant passage but it is not! at this point, that's my only option. I found a pic of some falconer heads on here and if you look real hard you can see that his heads have the heat riser port in the middle exhaust port too. ported stock heads vs ported sr 305 heads? 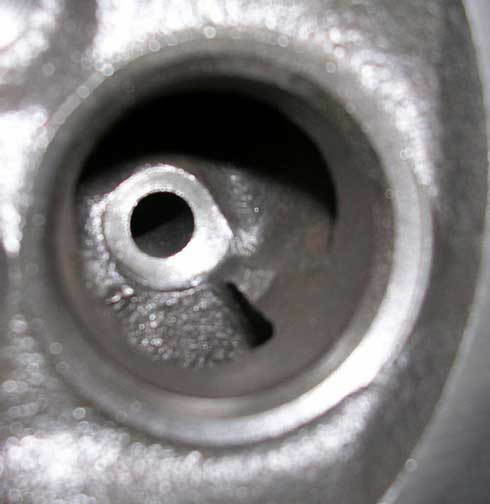 Are ported cast iron heads better than corvette aluminium heads?